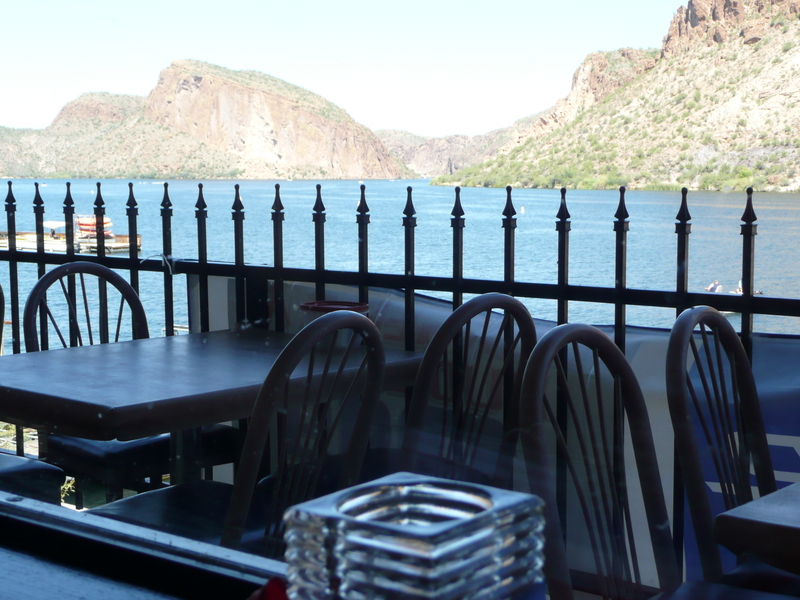 What a great way to spend a lazy afternoon on the water of Canyon Lake here in beautiful Arizona. Before we boarded the Dolly, Bill and I enjoyed lunch at the lakeside restaurant. 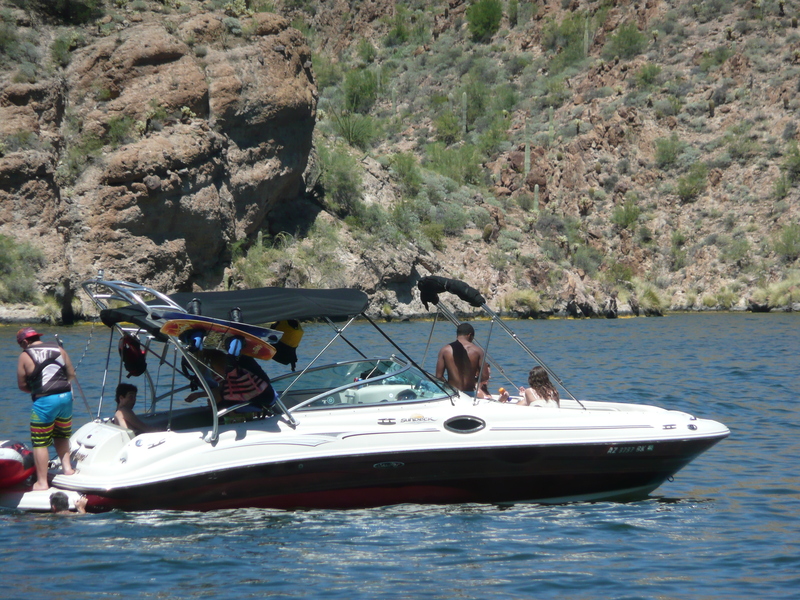 Then, we made our way down to the dock area and watched all the boats coming and going on the lake. When it was finally time to board the Dolly, we were lucky enough to get the first table inside the only air-conditioned part of the Dolly. This made the cruise even more relaxing because the temperature at the lake was 110 degrees. Our table overlooked the bow of the steamboat, and even better, we were seated right next to our Captain, Jeff. 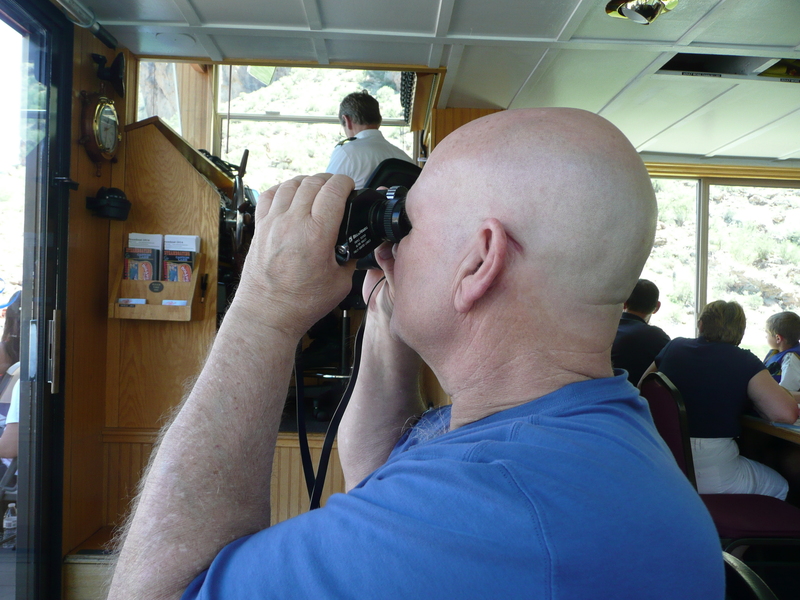 Once the Dolly was on its way, we enjoyed Captain Jeff’s narration of all the lake has to offer. 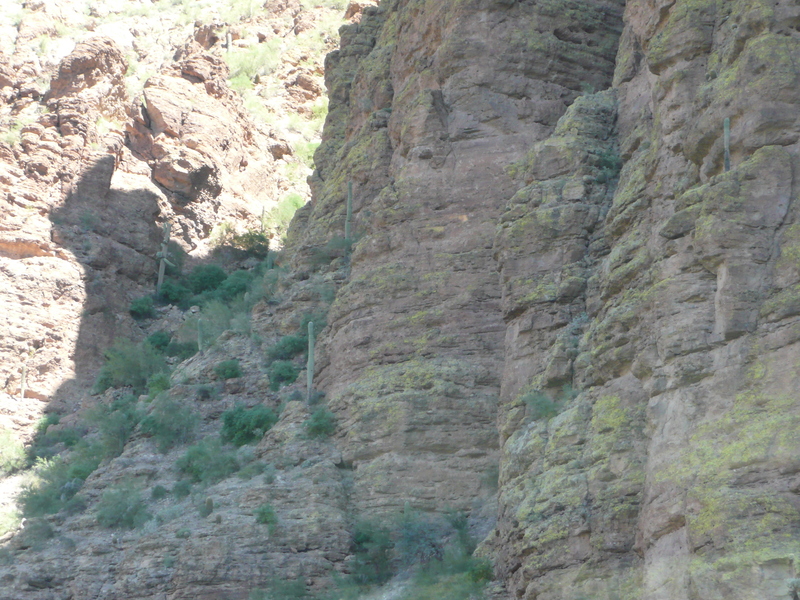 We were amazed by the wondrous formations created by a violent volcanic past. 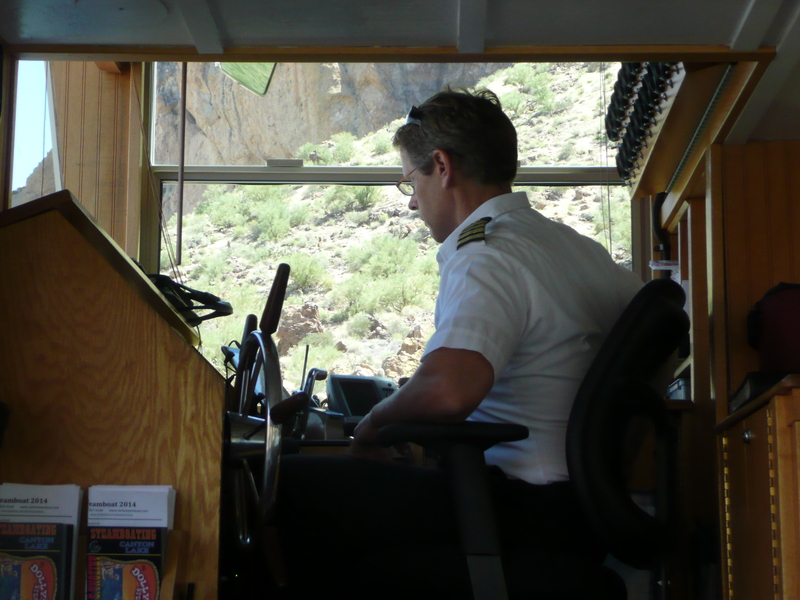 We listened as Captain Jeff recounted the legends and lore of the Mysterious Superstition Mountains and Historic Apache Trail. We saw a bald eagle, perched high on the side of a soaring cliff. The bald eagle is hard to see with the naked eye, but he is the dark spot about a third of the way from the top, and almost in the center of the picture. 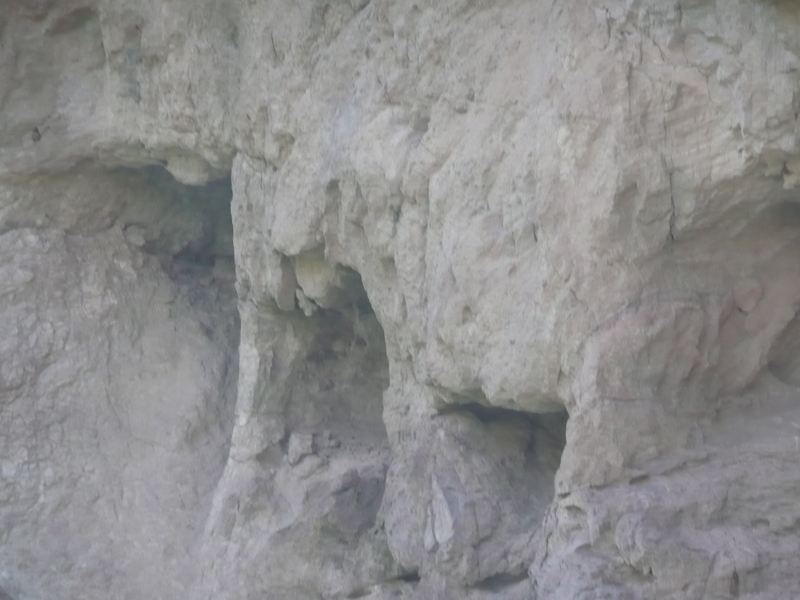 We also saw four bighorn sheep walking along the side of a cliff’s edge. It’s amazing how they can jump from rock to rock along those cliffs without falling. 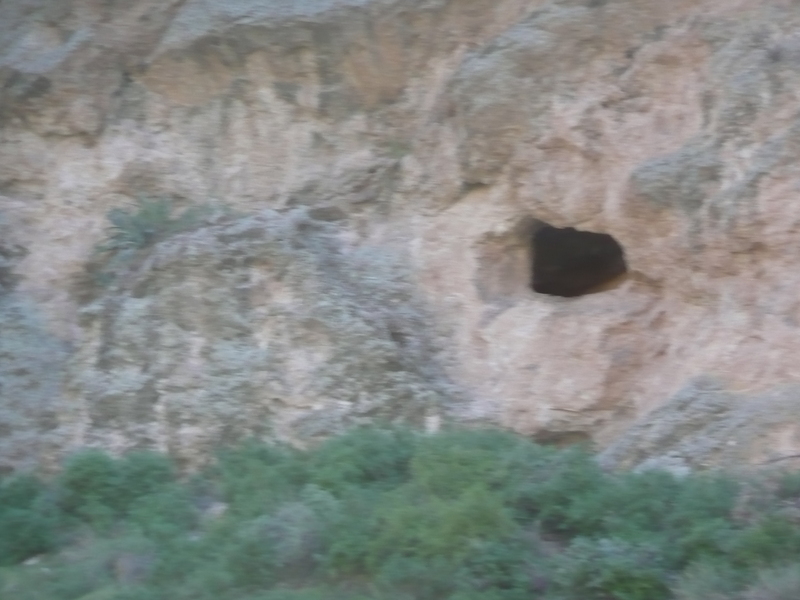 All among the cliffs are natural made caves. There are many natural rock formations, some, which require you to stretch your imagination to grasp, and some that are very easy to spot, like this elephant. Do you see his trunk, eye, ear, and legs? Captain Jeff told us if we have any trouble seeing any of the figures within the natural rock formations, they offer beer, wine, and spirits to help us along with that. Ha! 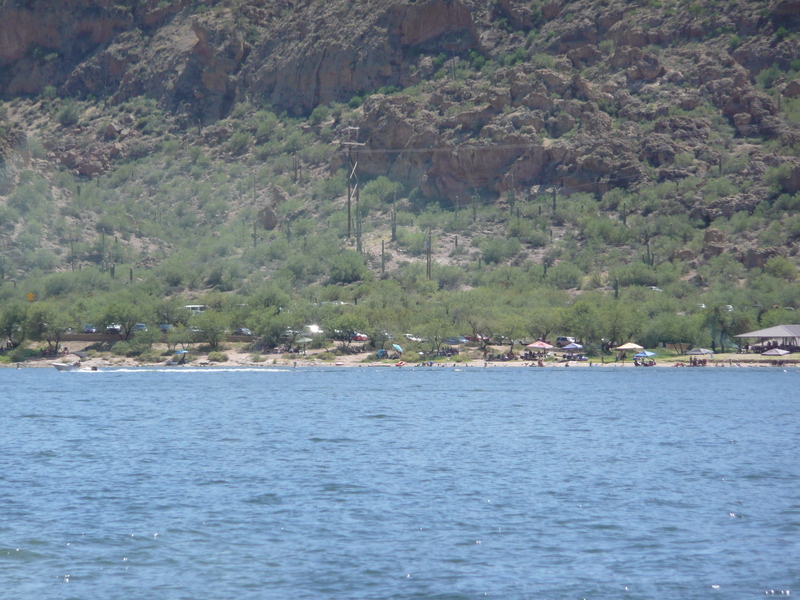 We learned that there are camp sites all along the lake that are accessible only by boat and that have a two-week stay limit per visit. As we cruised the lake, we saw many other people out enjoying their boats, jet ski’s, and all sorts of other water crafts. 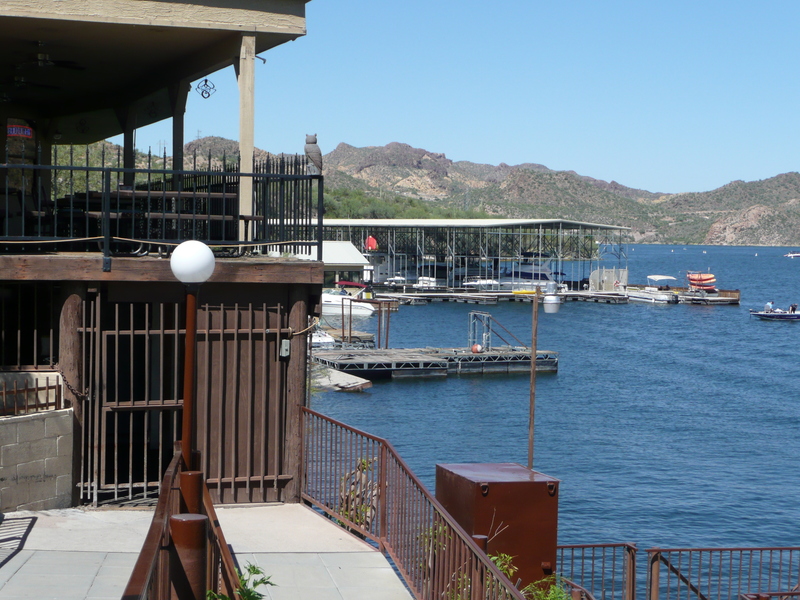 In addition, Canyon Lake offers plenty of shaded lake side picnic areas for family and friends to come and just enjoy the day and all the beautiful lake has to offer. The Dolly offers seating at tables for up to 135 passengers with abundant room to move about. I was surprised to learn that the Dolly can also be charted for Private Parties, Astronomy Cruises, Company Outings-Meetings-Parties, Weddings and Receptions, Christmas & Birthday Parties etc. I can only imagine how much FUN, FUN, FUN all that would be for me and 135 of my closest friends… 🙂 Who knew? 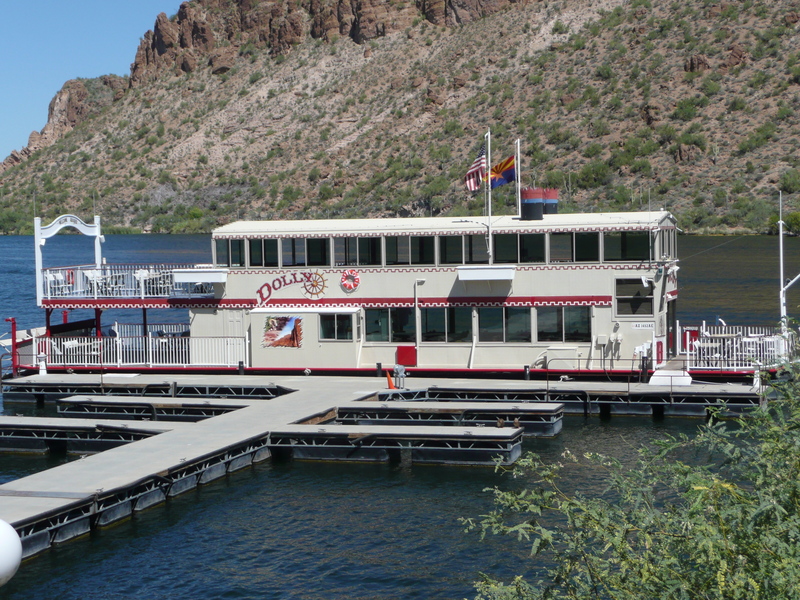 The Dolly Steamboat Cruise was truly a fun-filled way to spend a lazy, relaxing, afternoon, and we will be back! In my last post I talked about a power outage in our neighborhood this past week. About a half hour after the power went out I heard a knock on my front door. It was my next door neighbor, Kathy, wanting to know if the power was out at my house. I told her it was and told her I called the power company and found out the estimated time for restoring our power was going to be about two hours. She thanked me and said she just wanted to be sure it wasn’t just something wrong at her house. I met Kathy a few days after Bill, Shantel, and I moved into our home which has been almost 2 1/2 years ago. At that time Kathy told me she has lived in her home since it was new, and that her husband passed away two years before we moved here. She said she takes care of her grandson, Alex, and explained to me that Alex has Autism. Kathy stands out in front of her house everyday with Alex waiting for the special needs bus to pick him up to take him to school. Alex always has a headset on and will pace back and forth constantly while waiting for the bus to arrive. At the end of the school day, Kathy will be waiting out front of her house again for Alex to arrive home. Since our initial introductions when we first moved here, Kathy will say hello when she sees me but other than that she pretty much keeps to herself. So I was surprised that she came over to ask me about the power outage. While I was telling Kathy what the power company told me about the power outage and estimated time for restoring service, I noticed Kathy looking at the tile on our living room floor. She said she loved that tile and that she had looked in our house as it was being remodeled prior to us buying our home and the first thing she noticed was our beautiful tile. I invited Kathy in and said I would show her the house if she liked. She was hesitant at first but did come in and walked to the kitchen and family room. She told me she loved how I have decorated our home and was very impressed with our new sofa and rocking chair in the family room. I asked Kathy if she would like to sit down, but she said she couldn’t stay. She looked around and asked me where Shantel was and said she hadn’t seen the dial-a-ride cab bringing her home anymore. I explained that Shantel had moved out in May and was now in her own apartment. Kathy wanted to know if Shantel had roommates and I told her no, she lives alone. I told her I talk to Shantel everyday and I go over once or twice a week to help her get groceries or run errands. Then Kathy asked me if Shantel was completely blind. I told her Shantel lost both her eyes to cancer just before she was two. Kathy asked me if Shantel was adopted and I told her she was and that her biological mother is my oldest daughter. As I was talking to Kathy I noticed she was beginning to get a little emotional. Then Kathy just opened up and started telling me all about her grandson, Alex. She said her only daughter gave birth to Alex, but Kathy has been caring for Alex since he was seven weeks old. Kathy said at first her daughter would come and see Alex from time to time, but never really spent any real quality time with him at all. Kathy said she thought it was just a temporary phase her daughter was going through and that she would eventually settle down and want to raise her son. As time passed Kathy said she began to notice Alex was not developing normally. He wasn’t doing the “normal” things other children his age were doing. His speech was very slow in developing and he had a lot of difficulty staying focused on anything even for short periods of time. Kathy asked her daughter to take him to a doctor to be evaluated but her daughter told Kathy she didn’t have time and told Kathy to find someone to look at Alex. Kathy took Alex to several doctors and all the doctors said the same thing. Alex has Autism and he is going to need constant supervision for the rest of his life. Kathy told me when she called her daughter to tell her what the doctors said, her daughter said “well, you can just keep him because he is an embarrassment to me and I don’t want any more to do with him.” Kathy said she didn’t say anything to her daughter, but she was thinking by her daughter saying that about her own son, her daughter is an embarrassment to her…! I told Kathy she is a much better woman than I, because keeping my thoughts to myself in a situation like that has never been my strong point! By now Kathy was in tears and told me she worries constantly what will happen to Alex when she is no longer able to take care of him. I was very surprised when Kathy told me she is seventy-four years old (she certainly doesn’t look her age to me) and that she doesn’t have any other family members around to help her with Alex. I asked her how old Alex was and she told me he is just sixteen. Kathy asked me if I worry constantly about Shantel and I told her I do, but I know Shantel can care for herself, and I do have family and friends that would help her if she needed help and Bill and I were not around. I wanted to talk to Kathy about looking into a group home that Alex could live in once he was out of school but I could see that particular day was not the right time to even mention that. I know of another boy with Autism and his parents (they were a little older as well ) made that arrangement for him so he could adjust to the home while they were still able to check in on him to be sure he was being cared for properly. At last report, that boy was doing well and enjoying his life. My heart aches for Kathy, and all mothers who love and care for all the precious, precious, children with special needs. No one but another mother of a child with special needs can truly understand the pure joy these children bring into our lives, or the piercing heartaches sometimes endured. These special mothers are always in my thoughts and prayers. Simon and Garfunkel had a hit song titled The Sound Of Silence. It’s one of my favorites. If you never heard it you should Google it and also read the lyrics. I think it is very powerful and thought-provoking. This past week I had a rare opportunity to really experience what the real sound of silence is like. We had a power outage due to a breakdown with one of the power company’s electric breakers. The power outage affected over a thousand customers within my neighborhood and surrounding area. I called the power company to find out what the estimated time of recovery to restore the power would be and was told it would take approximately two hours. 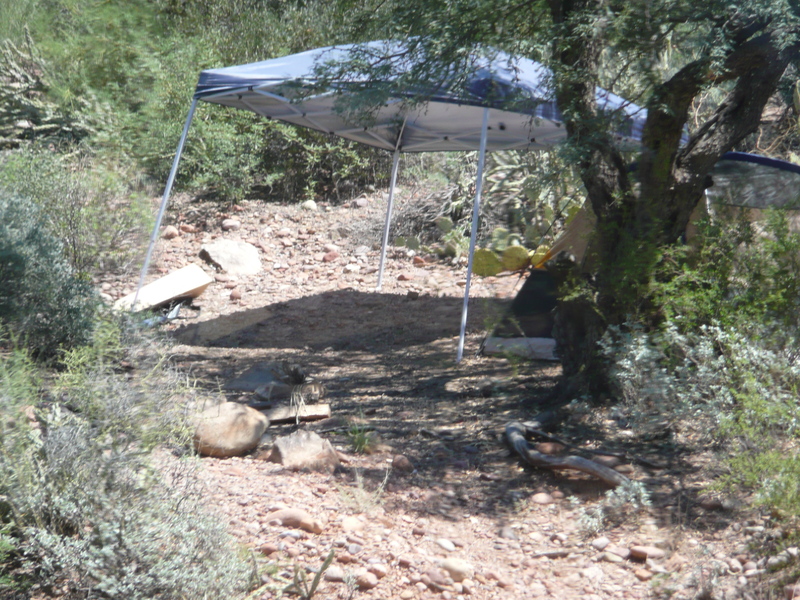 What to do for two hours without any power what so ever, in the middle of August in Arizona…? I decided I would go over and visit my mother at the Care Center again. She would be surprised to see me and I could visit with her in a refrigerated building… So, I got my keys and headed out the door and into the garage where I learned very quickly that, hello,… the garage door is electric and will not open during a power outage unless you are super woman and strong enough to pull the emergency cord and manually lift the garage door. I tried and tried but I could not get that door up. So, I went back in the house to wait it out. Once in the house, I sat in my rocking chair and became very aware of just how quiet the house really was. In the summertime I do water exercises in the pool every morning, then have my breakfast and coffee out on the patio. I consider that my “quiet” time where I can sit and reflect all by myself with only the sounds of nature or traffic sounds to listen too. Seemed pretty “quiet” and peaceful to me. I guess I have become so unaware of the everyday sounds of my house, like a fan running, the refrigerator motor, the ice machine making ice, or the refrigeration unit coming on etc. that I thought my house was pretty quiet, until that power outage hit and everything was completely silent. No clocks ticking, no dishwasher running, no fans, nothing, just complete and absolute silence. I could have picked up my smart phone and played a game or checked out Facebook etc. like so many people do. But, instead, I decided I would spend the time reading. I always have a good book to read on my end table. I got all settled in my rocking chair and started reading. But the more I read, the more distracted I was by the silence of the house. Finally, I put the book down and decided I would see what it’s like to sit and just be still in complete and absolute silence, and I’m so glad I did. At first it was hard for me to just sit still. However, I made up my mind that I was going to do this little experiment so I did. I just sat, and the longer I sat, the more I began to notice my mind and whole body was really beginning to relax… And, the more my mind and body relaxed, the more I was able to clear my mind of all the thoughts and gibberish that runs through my mind throughout the day… like what I need to be doing next, where am I supposed to be next, etc. All that just seemed to melt away and I just let the silence take over and it was a very rejuvenating experience. I have never been one to call just anyone my friend. People I consider my friends are people I actually love, respect, and enjoy spending quality time with. I don’t have the time, nor do I want to spend my time playing games with people and wondering if we have a real friendship or not. At this point in my life, I know who my real friends are and I treasure each and every one of them. Real friends are like part of my family or extended family. They are people I bring into my home and my life. Each of my friends have a different place in my heart and each of their friendships are unique and special. I always wanted my very best friend to be someone who knows everything there is to know about me and still love me. I have a friend like that. I have the added blessing that my very best friend is also my husband and shares my day-to-day life. He knows my strengths and insecurities, he shares my values, as well as my hopes and dreams for our life and family. He always puts me first and is always there for me. We share a love that allows us to be our best individual selves, but we believe together we are so much better. Sometimes a friendship becomes more than a friendship. I have a friend like that. I found myself thinking more of this person as the sister I never had so we made each other sisters by choice. This friend is the one I asked to raise my daughter, Shantel, in the event anything ever happened to my husband, Bill, and I. I trust her with everything I have and I know she feels the same way about me. She has been there for me through thick and thin. She was there through all of Shantel’s surgeries, she came to every one of Shantel’s birthday parties and every Christmas… She has my heart. I love this woman. I know I can always count on her no matter what, and she knows I will always be here for her. She is truly my sister by choice. If you have a friend that helps you grow, expand your mind, your comfort zone, and thereby your world… you are truly blessed. I have a friend like that. In fact, she is more than a friend or a sister, so I call her my frissy. She is my opposite in that she is well-traveled, fearless in taking on new adventures, and has a zest for life unlike anyone I have ever known. She has shown me things I would otherwise have never seen. She has invited me and my family to places we would otherwise have never been able to go. She has shown me the world by sharing her travels through her amazing photography. We have laughed until we cried and cried until we laughed together, and I would not trade our special bond for anything in the world. She is without a doubt one of the most amazing people I know and I am blessed to have her in my life. Every once in a great while you meet that special someone who just makes you want to smile every time you see them. I have a friend like that. She has such an appreciation for even the smallest of details of everyday life. She is strong and independent but also childlike in the way she sees the world in that everyday life is truly a wonder world to her. When she laughs it makes my heart sing. Sometimes when she is talking, her eye will catch a glimpse of something new, and she can change the subject faster than any child I ever knew and begin a whole new conversation that makes me wish I could always see the world through her beautiful eyes. I’ve heard others say when they think of her, they think of pure joy and I couldn’t agree more. It is a true blessing to be called her friend. Having these wonderful friends in my life is a blessing in itself…. but this past weekend, I had the rare opportunity to spend time with all but one of them. What a fun-filled, wonderful weekend it was just spending quality time with friends like that! When I was growing up, and attending Catholic schools, I learned in religion class that longsuffering is one of the gifts of the Holy Spirit and that longsuffering is a fusion of patience and power. Merriam-Webster Online defines longsuffering as: Suffering for a long time without complaining: Very patient during difficult times. I went to visit my mother at the care center again today. She was very surprised to see me even though I told on Tuesday that I would be back on Thursday. 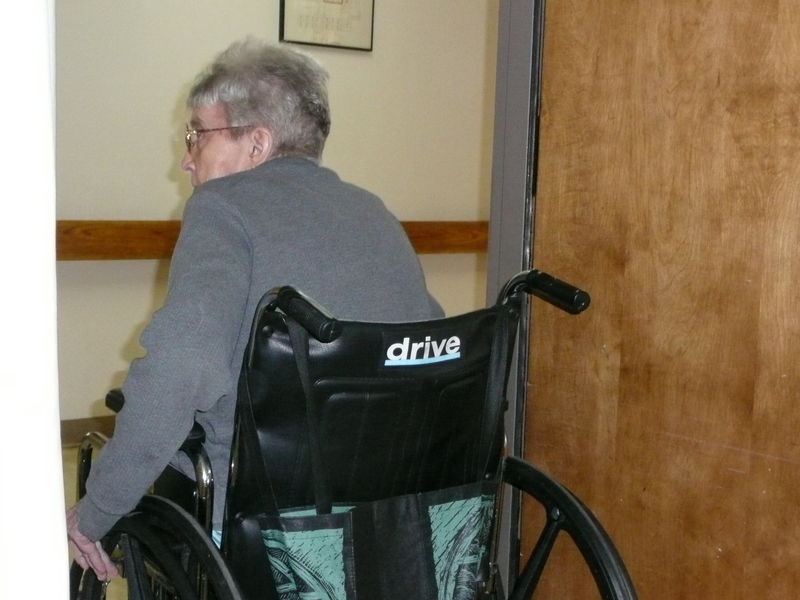 When I arrived at the care center, my mother, along with several other residents, were all sitting in their wheel chairs just outside the dinning room waiting for the doors to open so they could go in for lunch. Lately, when I go to visit my mother, I try to time my visit so I can sit with her through her lunch. Not only does it allow me an opportunity to encourage her to eat her lunch, it also makes visiting with her more productive because my mother doesn’t engage in conversation much anymore. However, her tablemate, Joan, is a big talker and kind of fills in the episodes of silence when my mother can’t find her words. If I ask my mother a question, she will usually answer me, but more often than not now, I don’t know if she is telling me something that really happened, or if she is telling me her version of what she thinks is happening in her world. So, I try to keep our talks short and try not to ask her too many questions. 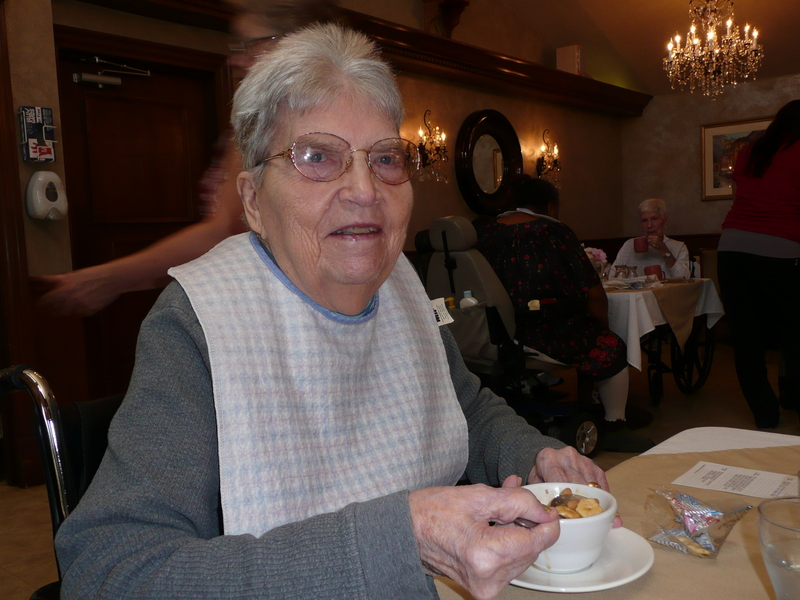 Today, as I sat with my mother during her lunch, I just asked her to smile so I could take her picture so I could post it to my blog for friends or family members to see that she looks good and she that did eat a couple bites of her soup. 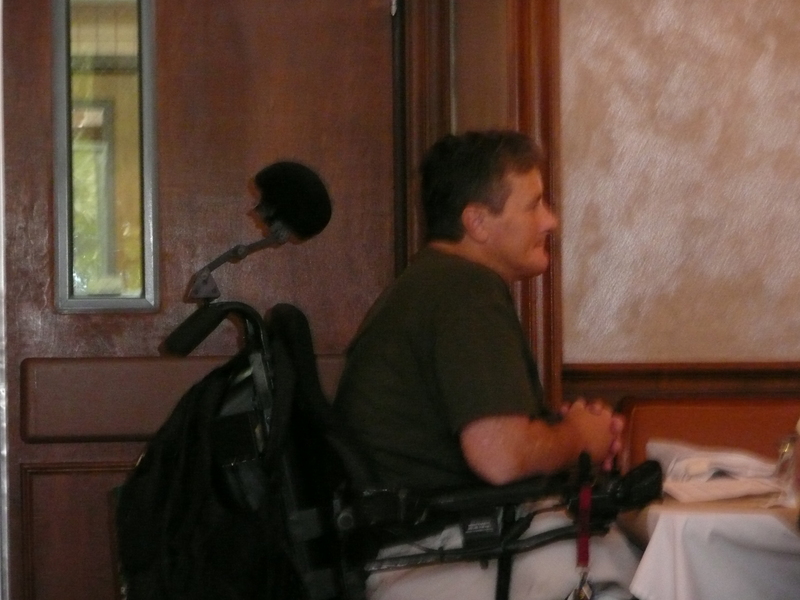 While I was siting through lunch with mom, another resident, David came in and took his place at his table. David is one of the most amazing men I’ve ever met. To me, he is the true definition of longsuffering in the flesh. David is only 51 years old. He was an Air Force Pilot and lost one of his legs while in service to our country… He also has a terminal illness that reeks havoc on his body, and knows he is going to be in a care center for the rest of his life. He has a colostomy bag ,and one of the nurses told me that even though they know he is in pain most of the time, he never complains. David’s room is next door to my mother’s room so I’ve been blessed with the privilege of seeing David a lot, especially now that I am spending more and more time with my mother. David has a power wheelchair and usually when I see David, he is pushing one of the residents that don’t have a power wheelchair down the hall so they don’t have to work so hard getting to and from the lunchroom, activity room, etc. In fact, David is almost always the last one to get his meals because he is so busy helping to make sure everyone else gets to the dinning room on time. But when David finally gets to his table for lunch, his tablemates are waiting for him to lead them in prayer before they eat. My mother has been in the care center for five years now and I’ve spent many, many, days visiting with her there. And in that time, I’ve seen many, many, people who are sick, lonely, in pain etc. but seldom have I ever seen anyone who deals with their condition like David… I am humbled and honored just to be in his presence. When our daughter, Shantel, lost her sight just before she turned two, bedtime became very much dependent upon sticking to a routine. Because Shantel has no sight, not even any light perception, she has nothing to trigger her brain that it is nighttime, and time for her to go to sleep. Going to bed, check your doors, and never forget how much you are loved. Papa, Carmen, and Mom. Today, like most Wednesday’s, I drove to our daughter, Shantel’s apartment to take her to purchase her weekly groceries. Today, being the first Wednesday of the month, is senior citizen discount day at Fry’s grocery stores. I can put Shantel’s groceries on my Fry’s VIP card and she gets 10% off her groceries just like I do. With the tight budget she is on…. every little bit helps. We bought the groceries which turned out to be eight, heavy bags full… Half of it was food and half was cleaning products.. Shantel then proceeds to tell me “just in case we do end up having to carry all these groceries for a half a mile, we better ask them to double bag everything.” She said every time her friend, Jaz, and Shantel go anywhere with bags full of stuff the bags usually end up breaking and Jaz has to pick stuff up from the sidewalk. Now I’m thinking to myself… OMG, could this just get any better? Once Shantel and her groceries were safely home, guess what I had to go do…? Yep, I still had to go purchase groceries for my house… Wouldn’t want to miss the first Wednesday of the month senior citizen 10% discount, now would I?